If you have ever been inside of a cave in the winter time you know first hand that the surrounding rock and earth form a natural barrier against the cold and the area maintains a constant temperature. 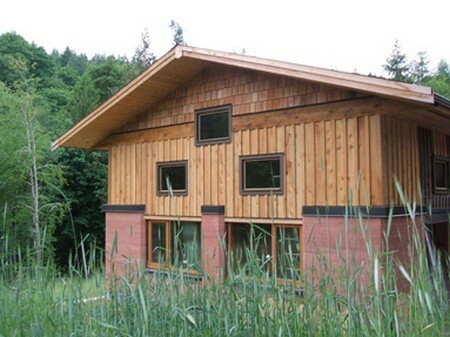 Earth homes are a good, energy efficient way to build. Snug in the winter and cool in the summer. Fire and termite proof, houses like it have stood for centuries, some for millennia. Let’s look at the steps and see how easy and inexpensive it is to build one. First make sure that you have the correct kind of soil. Sandy but not all sand (50%-70%). Not too much clay either, or the walls will shrink and crack. Take a sieve, spread out a tarp and filter out all the rocks and roots. Turn your earth into sandstone the same way nature does, with pressure. Spread out your tarp to protect your earth from participation. More than 10% moisture and the earth won’t hold its shape. Your foundation will need to be reinforced concrete. Extend it from about 12” both above and below ground. If you live in a cold climate you might want to go as deep as 24” below. Lay the foundation in 8´sections, each dovetailed into the next with reinforcing rods. The forms will be about 12” wide and taper to 8” at the top, then out to 12” at the bottom. Use 2 x 6 planks, lined with building paper and strengthened on the outside with 2×4 uprights. Prepare your concrete mix from 1 part cement, 2 of sand, and 3 of gravel. Once your first sections are dry remove the plank forms and move to the next section. Frame the door and window openings as you go along and brace them well. Set all the forms before you begin to ram the wall. The South Dakota State College bulletin 277, Rammed Earth Walls for Farm Buildings is a good tutorial. If you are working alone use 5/8” marine planking, it’s lighter and very strong. Line the wooden molds with shoot steel and reinforce with 4 x 4 uprights. The molds should be about one foot wide. Shovel a 4” layer of dirt into the form, pound the earth until it rings like rock, and then repeat. The rammed earth hardens as it dries so you can remove the forms as soon as they are filled. Stagger the joints in each course. The library is loaded with books on how to build a roof, frame a window and wire your new house. Concrete frames are best because they do not warp; only slant the lips to the water drips away from the earth wall. 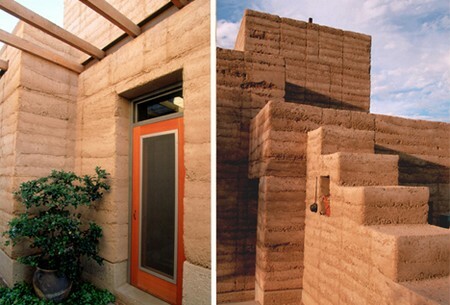 Rammed earth homes are energy efficient, long lasting and easy enough for one person to build. Since most of the walls are earth, i.e., dirt cheap, they are inexpensive also.